Can you please let me know your thoughts or advice on Fort worth, TX single family investment for rental purpose? How is the city's rental market and what are the pros and con's? There are a couple of really solid areas in Ft Worth proper...primarily directly around downtown and the historic & TCU areas just West of downtown. Rents have skyrocketed, but so have property prices. If you really want to stay on the Tarrant County (Ft Worth) side of the Dallas/Ft Worth Metroplex, I would suggest some of the surrounding suburbs. Keller, Hurst-Euless-Bedford, North Richland Hills, Watagua & Roanoke all maintain good value and solid rental rates. There are some other areas, but they are pockets, not entire towns/cities. However, if you stay with the towns I noted, you'll be pretty safe in terms of no war zones. Depending on your price point and how close to Ft Worth proper you want to stay or if you are willing to look at Dallas county, there are other areas where your value and rental rates are better. Feel free to PM me or just give me a call, if you want some additional market related information. I love talking about the DFW real estate market. Appreciate your help Hattie! The detailed info you gave me really helps to get started. Can you please let me know your opinion about Haslet suburb? Also which regions in Fort worth have less property taxes? Around Euless they all seem to be very high. Arlington is pretty good, too. TCU is a very popular area for rentals. One way to search unfamiliar areas to see if the property values are going up is to look on Google maps and look at the land. If the land is near the city but not far enough to be "suburban" (there is still land in the area to potentially be developed), then it may be a good place. Don't worry so much about the house, but more about the land, more specifically the scarcity of it. You're not necessarily buying the house but the land that it sits on when it comes to appreciation. Then look at other factors in that area: vacancy rates, MOI, DOM, and so on. This is what makes areas like TCU so popular for buying rentals, because there is just no more land available, but DFW is growing by 100K people a year. There is a high demand and not enough supply. A lot of experienced investors rent a house for 1 year then sell it. You cannot legally lease/option in Texas but there are other legal systems to do something similar (that are apparently better anyway). This will keep you from taking a big income-tax hit from the "flip" and only pay a 15% capital gains tax. If you are an out-of-state buyer and looking for bigger investments, there is some serious complex appreciation going on in south Dallas. Toyota is going to bring some serious jobs and serious population growth to that area, and apartments near the city have their rent even doubling (double the rent = the property value going up like 10 times). Anyway I'm going on a huge tangent. Whatever you do, stay away from a traditional real estate broker when looking for investment properties...that is a huge waste of time. You don't submit an "offer" on an investment property...that is a guaranteed fail. They have no idea what they are doing...ask them what the "months of inventory" are in an area (vs DOM) and if they have no idea what you're talking about then hang up the phone. The number of ways that I disagree with the young Mr Carr can't even be counted. I really have no idea where he is getting some of his information. Let's start with the notion that Lease Options are illegal in Texas. Not true. There are restrictions, and they have to be done exactly right, but they are definitely legal. Here's a link, just to prove I actually do my research before I make statements. Further, the only reason not to bother with a traditional broker is simply because there are very few deals to be had in DFW via the MLS. The ones that are available are mostly REO, and it's extremely competitive. All of that is mostly owing to the fact there is less than 2.5 months of inventory available for the entire Metroplex, which includes areas no one really wants to live in. The areas of high desirability have less than 30-days of inventory on the MLS. Now, back to your actual question about Ft Worth, taxes and Haslett. In Texas, taxes are collected by county. However, within each county there are multiple taxing authorities such as school districts, hospital districts, cities, counties, special taxing authorities, etc. You're going to find that property taxes in Texas are generally higher than you will find in a lot of other areas of the country. Texas has no state income tax, more reasonable property values, great economic & job prospects, and lower cost of living. That doesn't do a lot to help out of state investors. But, it does help protect the general real estate market. There are definitely areas of Tarrant County (Ft Worth is the county seat of Tarrant county) that have higher/lower taxes than others. But it varies wildly, so it's difficult to make generalizations. Hurst-Euless-Bedford (aka...HEB) has generally lower taxes. Grapevine is reasonable, as is Arlington. Haslet taxes should be pretty reasonable as well. Southlake is probably the highest you will find in Tarrant County. Haslett is not a bad area at all. There's probably opportunity there. @Hattie Dizmond Some areas within HEB have tax rates higher than Southlake. Haslet is an rural area that is rapidly becoming Urban, and would make a great buy and hold area, if you are in the right neighborhood. Currently, Haslet's size vs. property values helps keep it the taxes lower in this area. Unless you actually are looking at a property that falls within the city of Fort Worth. Because of the taxing system in Texas, the city of Fort Worth he's grown exponentially in the last 10 years. It has doubled in taxable land values, and tripled in total area, due to its open annexation policy. With that being said, in the area that the property is located @Seetha G you will want to verify the actual city the property is located tax wise. The difference between Haslet's and Fort Worth's city tax is about 1/2 percent. Which in tax terms is $500 for every $100,000 valued property. Since homes in that area tend to appraise for closer to $200,000; you may end up paying an extra $1,000 in taxes a year. You could run into a similar problem with Northwest ISD and Keller ISD. As for the area itself, it is a great area, with rapid growth. There are major employers in that area, FedEx, Motorola, Alliance Airport, Texas Motor Speedway, American Airlines, and many more. Rentals go for more in that area as well. Overall, if the money is right, that would make for a good place to be. Texas law requires that property tax rates for the past five years be made available to the general public. Tarrant county has a page dedicated to "Truth in Taxation" law. Well, I'll take your word for it. But, I've not seen anything in HEB that could touch Southlake for taxes. @Hattie Dizmond I am only comparing tax rates, not property values. That is where the difference is. Southlake values are generally higher than the HEB area. In HEB the home values average range from the 70s-300s; while Southlake's range from the 200s-1mil+. But like any city you will find million dollar homes, you just find a bunch more in Southlake compared to Hurst, Euless, or Bedford. Funny thing is the two most popular rental areas are the same two areas with the highest tax rates; Crowley and Keller. The most affordable two areas in Tarrant County for taxes, Azle and Arlington outside Mansfield ISD. Keller is an area I usually send people who are looking in Tarrant county toward. Arlington has deteriorated recently, and the only area I would personally consider is SW Arlington in the Martin HS area. @Seetha G @Hattie Dizmond gave you some good rental areas to look at. People like Keller because of the ISD so if you look at Keller I would recommend a 4 br rather than a 3br. Haltom City is covered with renters as well. Mansfield is also popular due to the ISD. Thankyou all for your valuable inputs! Good points everybody, but I wouldn't buy a property in the historical district, especially if you're out of state. Way too many red flags and hoops to jump through...you someone on the NPO to approve of your renovations, you need a contractor who is familiar with the historical district requirements, and you need a friend out here to push it through the NPO (if it gets approved). Not to mention the stringent requirements of renovating a house in the historical district, you even need particular building materials to work with. Even if you live here, I've seen a project turn bad very quickly in Fairmount when a contractor made an addition too large. For an out of state investor, this could very quickly turn into a nightmare. Do not even look at the historical district if you're out of state. Lease options are legal, but the legal requirements are a bit too much for an out of state buyer to meet the "verbiage" and "disclosure" requirements. You will need to speak with an attorney and possibly spend a few thousand dollars to draw up the contract that meets the legal requirements. Currently, if you go over a 179 days on a lease option without the title transferring, it's a $20,000 fee per day. Another nightmare not even worth your time. What you can do is put a sign on your lawn saying "rent to own" and just lease it out to a good tenant who wants to buy it in a year. You will help them build their credit so they are capable of buying the property in a year if all is well. That way you avoid short term capital gains taxes when you sell it. A local man named Dennis Henson has a program with everything drawn up about this, and has had some great success with it. You can look him up if you want. @Hattie Dizmond @Greg Carr @Richard D. Thank you guys for your advice/info! I am currently looking for an MFR/SFH (purely for rental purposes), but being out-of-state, it's difficult to assess which areas are worth diving deeper into. I'm definitely going to be visiting in the next few weeks, but I want to prepare myself as much as possible before I go. I'd love to get your guys' analysis on the bottom picture I have displayed. Which numbers would you grade as "A" ? I'm looking for low crime, good/easy-to-find tenants, job stability, and a bit of appreciation. Really going for strong cap rates and good tenants with this purchase, as it will be my first out-of-state buy. I want a good experience so that I can gain some confidence in OOS investing. I would avoid trying to break up Dallas/Fort Worth this way. Your geographic areas are too large. The vast majority of 3, 7, and 8; are not that good, but do have some great areas within them. There are some war zones in 5, 2, and 4; while having a large area to work and large amounts of competition. Zone 6 is still growing, and Hattie will swear to area 9 (the parts north of 1, 2, and 3). I work area 1, and 5. Just my personal choice for what I target. Both are good for rentals. But expect to get targeted by other investors that want to buy your properties. I would say go for Keller ISD, Euless, Bedford, Plano. These are all great school zones. I have mine in Keller ISD and doing great so far! If any of you could message me with contact info of an experienced RE agent for the DFW area that is competent about the market and works well with understanding investor goals, please message me his/her info. I'm hoping to purchase a buy-and-hold rental. Disclaimer: Please don't recommend yourself or any company you are affiliated with. I'd prefer to hear someone who has invested through an agent and had a good experience. @Jason J. Your boxes are definitely too big! The DFWA MSA is 9,200+ sq miles. 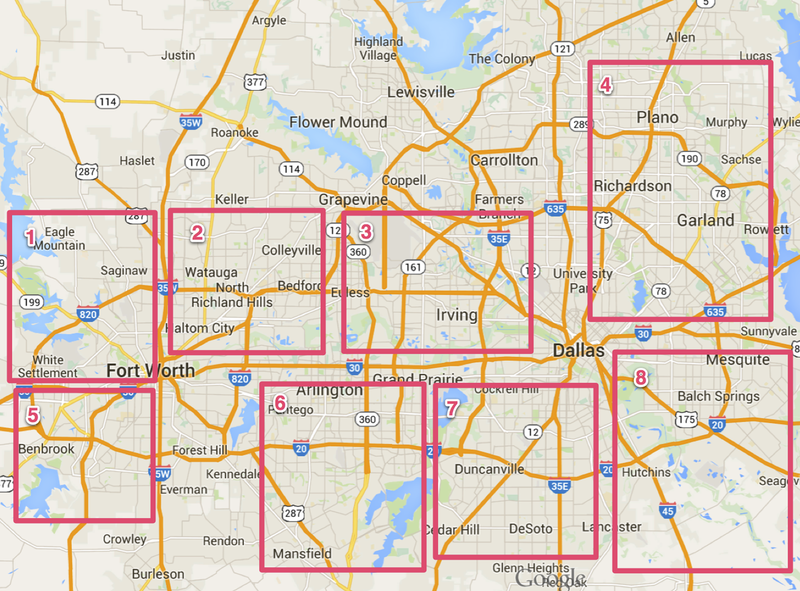 The best way to look at the Metroplex is to break it down into sub-markets by ISD. Then within each ISD, the High School/Middle School/Elementary School feeder areas become micro-markets. You will quickly find, because of the relative ease of commuting here compared with other major markets, school districts and not proximity to services/employment drive desirability. Also, school districts in Texas are not defined by city boundaries. My best example is Richardson ISD. "A" school district with some A++ schools/feeder areas in it, but it encompasses most of Richardson, some of Dallas and some of Garland. I highly recommend, as an out-of-market investor, you work with or partner with someone locally, because the place is just so big and diverse. Sorry Jason, I cannot recommend a specific agent. The ones that I've tried working with have been clueless as to what fits an investors need, and focus on what fills their pockets with larger commissions. Granted there are 1000s of agents in the area. I just have not been lucky to find one I like on a continuous basis. But a good RE company is 21st Century Judge Fite (in Tarrant County), or Ebby Hollday on Preston and NW Hwy in Dallas. I've had decent luck with the people at both companies. Just not enough to warrant a preference over the other. @Jason J. I have a realtor I work with, both for myself and for the out-of-state & off-shore investors I help invest in DFW. He's very easy to deal with and understands what investors want & need to know. He's also very good at and willing to support your needs, as a remote investor, by facilitating inspections and access to the property for estimates, etc. Feel free to PM me or email me at my private email address below, if you would like his name & number. Hi Jason. I just sent you a PM. I'd suggest for you to look into Benbrook, Watauga, Richland Hills and north side of Haltom City. Some parts of Arlington are also great. You'll find properties in the 100-130k range that rent for 1k-1.3k. Another area that is great for rentals, although with lesser appreciation, is White Settlement and central/south Haltom City. Some people don't like these neighborhoods, as they have houses from the 50s and 60s, but these are solid blue collar neighborhoods with lower property taxes, high rental demand and good tenants. We just bought and rehabbed two properties in White Settlement for less than 80k (including rehab), and leased them in less than 2 weeks for $1050 each. In a hot market like DFW it's hard to find deals on the MLS. The (hard to find) deals are always off-market properties. We invest in rentals, mostly in Tarrant County, and provide turnkey services to out-of-state and out-of-country investors. I'm negotiating a deal right now in area 5. It's a 16-unit property and I'm putting together a presentation for a business partner. What cap rates are you seeing in area 5 right now? Much appreciated!! Hello, I found this older thread and thought I'd try my luck asking for advise from someone in a similar boat. I am looking for a investor-friendly broker and property manager in Dallas/Fort Worth. Does anyone have any recommendations? @Henry Wang email or pm me and I’d be happy to help.